If you'd like the pleasure of a few beautiful fish but don't have the space for a large aquarium, a fish bowl may be just the solution you need to bring some finny friends to your home. Fish bowls are small, inexpensive and easy to maintain. There are an endless variety of decorative plants and gravel to personalize your fish's new home. It can be tranquil and restful or a bright and decorative focal point. Here are a few tips for selecting, setting up and maintaining your fish bowl. You will also need water conditioner to remove chlorine and other harmful contaminants. Water can be treated with a variety of chemicals and your local pet store will know which conditioners work best for the water in your area. You should also select gravel, stones or marbles to cover the bottom of the bowl. Select whatever appeals to you. 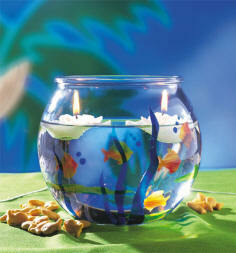 Decorative plastic plants are also an option; ;live plants do not thrive well in fish bowls. A small net is also needed to remove fish during bowl cleaning. Wash your new fish bowl with warm water and non-iodized salt. Don't use soap, bleach or glass cleaners as they may leave residues. Wash all gravel, rock and decorations and rinse them free of excess color or dust. Place the gravel in the bowl to a depth of about 1 inch of gravel per gallon of water. Add room temperature water and the proper amount of conditioner. Let the bowl stand for an hour before adding the fish. Float the bag containing your new fish in the bowl for 10-15 minutes. Add an equal amount of water from the bowl to the plastic bag and float another 10 minutes. Gently tip the bag and let the fish swim free. Do not buy too many fish or select fish that are too large for the bowl. Remember, the fish waste is not processed and broken down like it is in an aquarium. You don't want your fish bowl to be a sewer. Water in the bowl should be changed no less than once per week and sometimes more often. It should appear crystal clear. If it is hazy, off color or you see waste accumulating at the bottom, it's time for a change. Gently net your fish into a clean plastic bucket (used only for fish) that contains room temperature, conditioned water. Wash the bowl, gravel and decorations in warm water with a little salt. Replace gravel and decorations. Add room temperature and conditioned water to the newly cleaned bowl and then replace the fish.